"Akamai" redirects here. For other uses, see Akamai (disambiguation). Akamai Technologies, Inc. is an American content delivery network (CDN) and cloud service provider headquartered in Cambridge, Massachusetts, in the United States. Akamai's content delivery network is one of the world's largest distributed computing platforms, responsible for serving between 15% and 30% of all web traffic. The company operates a network of servers around the world and rents out capacity on these servers to customers who want their websites to work faster by distributing content from locations close to the user. When a user navigates to the URL of an Akamai customer, their browser is redirected to one of Akamai's copies of the website. Akamai Technologies entered the 1998 MIT $50K competition with a business proposition based on their research on consistent hashing, and were selected as one of the finalists. By August 1998 they had developed a working prototype, and with the help of Jonathan Seelig and Randall Kaplan, they began taking steps to incorporate the company. In late 1998 and early 1999, a group of business professionals joined the founding team. Most notably, Paul Sagan, former president of New Media for Time Inc. and George Conrades, former chairman and chief executive officer of BBN Corp. and senior vice president of U.S. operations for IBM. Conrades became the chief executive officer of Akamai in April 1999 and led the company from start-up to sustained profitability and positive free cash-flow before turning the reins over to Sagan in 2005. The company launched its commercial service in April 1999 and was listed on the NASDAQ Stock Market from October 29, 1999. On July 1, 2001, Akamai was added to the Russell 3000 Index and Russell 2000 Index. On September 11, 2001, co-founder Daniel M. Lewin died from stabbing while in flight in the September 11th attacks at the age of 31. Lewin was aboard American Airlines Flight 11, the first plane to crash into the World Trade Center. In 2005, Paul Sagan was named chief executive officer of Akamai. Sagan worked to differentiate Akamai from its competitors by expanding the company's breadth of services. Under his leadership the company grew to $1.37 billion in revenues. Sagan served as chief executive officer until co-founder and current CEO, Tom Leighton, was elected to the position in 2013. The content delivery process begins with a user submitting a request to a browser. When a user enters a URL, a DNS request is triggered and an IP address is retrieved. With the IP address, the browser can then contact a web server directly for subsequent requests. In a content delivery network structure, the domain name of the URL is translated by the mapping system into the IP address of an edge server to serve the content to the user. In addition to using Akamai's own servers, Akamai delivers content from other end-users' computers, in a form of peer-to-peer networking. When users request a download of some large files served by this system, it prompts them to download and install "Akamai NetSession Interface," a download manager used to reduce download time and to increase quality. However, this software operates not merely as a download manager (delivering content from the Internet to the user's computer) but also as a peer-to-peer server, delivering content cached on the user's computer to other users' computers. Akamai's Network Operations Command Center (NOCC) is used for proactive monitoring and troubleshooting of all servers in the global Akamai network. The NOCC provides real time statistics of Akamai's web traffic. The traffic metrics update automatically and provide a view of the Internet traffic conditions on Akamai's servers and customer websites. The State of the Internet report is a quarterly report Akamai releases based on data gathered from its Intelligent Platform, which provides global Internet statistics such as connection speed, broadband adoption, attack traffic, network connectivity, and mobile connectivity. Akamai’s data visualization tools display how data is moving across the Internet in real-time. Viewers are able to see global web conditions, malicious attack traffic, and Internet connectivity. In addition, the net usage indices monitor global news consumption, industry specific traffic, and mobile trends. Akamai also offers the Internet Visualization application, which allows users to view real-time data on their mobile device. On October 9, 2013 Akamai announced its Open Initiative at the 2013 Akamai Edge Conference. OPEN allows customers and partners to develop and customize the way they interact with the Akamai Intelligent Platform. Key components of OPEN include system and development operations integration, real-time big data integration, and a single-point user interface. On July 21, 1999, at Macworld Expo New York, Apple and Akamai announced a strategic partnership to build Apple's new media network, QuickTime TV (QTV), based on QuickTime Streaming Server. Both companies later announced that Apple had made a $12.5 million investment in the company the previous month. Apple continues to use Akamai as their primary content delivery network for a wide range of applications including software downloads from Apple's Website, QuickTime movie trailers, and the iTunes Store. In September 1999, Microsoft and Akamai formed a strategic relationship to incorporate Windows Media technology in Akamai's FreeFlow service, as well as to facilitate the porting of the FreeFlow product to the Windows platform; this relationship exists to this day. Microsoft Azure offers Akamai (along with Verizon) as options for its "standard" CDN service. Arabic news network Al-Jazeera was a customer from March 28, 2003, until April 2, 2003, when Akamai decided to end the relationship. The network's English-language managing editor claimed this was due to political pressure. In June 2008, The NewsMarket teamed with Akamai to accelerate dynamic content and applications to global media ahead of the Beijing Olympics. The BBC iPlayer uses Akamai to stream its recorded and live programs, focused through an XML playlist. The entire China Central Television website (CCTV.com), including its streaming video, has been hosted on Akamai's edge servers since late 2009. Hulu uses Akamai for hosting video. MIT OpenCourseWare utilizes Akamai's EdgeSuite for its content delivery network. Trend Micro uses Akamai for their Housecall antivirus application. 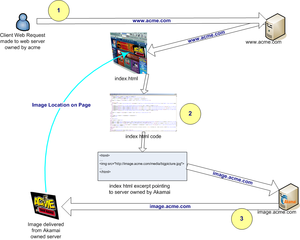 Valve Corporation's Steam (software) service uses Akamai's Content Delivery Network for storing screenshots and icons uploaded by users. Akamai provided streaming services to ESPN Star (India) during the course of the ICC Cricket World Cup 2011. Rackspace's Cloud Files use Akamai's Content Delivery Network (CDN) for storing its customer's files. On Feb. 10, 2000, Akamai acquired Network24 Communications for an aggregate purchase price of $203,600,000. On Apr. 20, 2000, Akamai acquired InterVU Inc. for an aggregate purchase price of $2,800,000,000. In July. 25, 2000, Akamai acquired CallTheShots, Inc., for an aggregate purchase price of $3,700,000. On June 10, 2005, Akamai acquired Speedera Networks, Inc. for an aggregate purchase price of $142,200,000. In Dec. 13, 2006, Akamai acquired Nine Systems, Inc., for an aggregate purchase price of $157,500,000. On Mar. 13, 2007, Akamai acquired Netli Inc. (Netli), for an aggregate purchase price of $154,400,000. On Apr. 12, 2007, Akamai acquired Red Swoosh Inc. for an aggregate purchase price of $18,700,000. On Nov. 3, 2008, Akamai acquired aCerno Inc., for an aggregate purchase price of $90,800,000. On June 10, 2010, Akamai acquired Velocitude LLC, for an aggregate purchase price of $12,000,000. On Feb. 7, 2012, Akamai acquired Blaze Software, Inc., for an aggregate purchase price of $19,300,000. On Mar. 6, 2012, Akamai acquired Cotendo, Inc., for an aggregate purchase price of $278,900,000. On Sept. 13, 2012, Akamai acquired FastSoft, Inc., for an aggregate purchase price of $14,400,000. On Dec. 4, 2012, Akamai acquired Verivue, Inc., for an aggregate purchase price of $30,900,000. On Nov. 8, 2013, Akamai acquired Velocius Networks for an aggregate purchase price of $4,300,000. In February 2014, Akamai acquired cyber security provider, Prolexic Technologies for an aggregate purchase price of $390,000,000. In February, 2015, Akamai acquired Xerocole Inc., a domain name system technology company. On Apr. 6, 2015, Akamai acquired cloud OTT IPTV service provider Octoshape, for an undisclosed amount. On Nov. 2, 2015, Akamai acquired Bloxx, a provider of Secure Web Gateway (SWG) technology, for an undisclosed amount. On Sept. 28, 2016, Akamai acquired Concord Systems, a provider of technology for the high performance processing of data at scale, for an undisclosed amount. On Oct. 4, 2016, Akamai acquired Soha Systems, an enterprise secure access delivered as a service provider, for an undisclosed amount. On Dec. 19, 2016, Akamai acquired Cyberfend, a bot and automation detection solutions provider, for an undisclosed amount. On Mar. 29, 2017, Akamai acquired SOASTA, a digital performance management company based in Mountain View, CA, for an undisclosed all-cash amount. One of Akamai's patents covers a method of delivering electronic data using a content delivery network. Internet Web site proprietors (content providers) contract with Akamai to deliver their Web sites' content to individual Internet users. The patented method permits large files, such as video or music files, to be stored on Akamai's servers and accessed from those servers by Internet users. This increases the speed with which Internet users access the content from Web sites. Unfortunately for Akamai, its patent was written in a way that called for or permitted actions by multiple persons or entities—such as the content provider customer and the company providing the CDN service. Akamai's competitor Limelight chose to operate its allegedly infringing service in that manner—it performed most steps of the patented process and its customers performed a so-called tagging step. Under the interpretation of patent law at the time when Akamai decided to sue Limelight for patent infringement, a method patent could be held infringed only when a single actor performed all of the steps. The court therefore overturned a $40 million jury verdict in Akamai's favor. Akamai initially lost the case, even taking it to the Supreme Court. The Supreme Court returned the case to the United States Court of Appeals for the Federal Circuit, however, with an invitation to re-evaluate its rule, if it chose to do so, that all the steps of a method had to be performed by a single actor for there to be infringement. On remand, the Federal Circuit considered the matter en banc (all active judges of the circuit) and modified its rule. It now held that a patent could also be directly infringed if "an alleged infringer conditions participation in an activity or receipt of a benefit upon performance of a step or steps of a patented method and establishes the manner or timing of that performance." On that basis, the Federal Circuit reinstated the $40 million jury verdict. It said that "Akamai presented substantial evidence demonstrating that Limelight conditions its customers' use of its content delivery network upon its customers' performance of" the steps that Limelight does not itself perform. This has been considered a substantial change in patent law. For further discussion of the case, see Akamai Techs., Inc. v. Limelight Networks, Inc. The National Security Agency and Federal Bureau of Investigation have reportedly used Facebook's Akamai content delivery network (CDN) to collect information on Facebook users. This report appears to show intelligence analysts intercepting communications between Facebook and its CDN provider, but does not indicate Akamai as being complicit in this process. ^ "Akamai Technologies Ownership Summary". NASDAQ. ^ "Akamai Technologies, Inc. 2017 Form 10-K Annual Report". U.S. Securities and Exchange Commission. ^ "Two teams win top prize in MIT $50K contest". MIT News. May 13, 1998. Retrieved June 11, 2014. ^ "Akamai Technologies Inc". Reuters. Retrieved June 11, 2014. ^ "Akamai Technologies, Inc. History". fundinguniverse.com. Retrieved June 9, 2014. ^ "Conrades to resign from Akamai". Boston Business Journal (5 January 2005). Retrieved January 11, 2015. ^ a b Frier, Sarah; Womack, Brian (April 26, 2012). "Akamai Says CEO Sagan to Leave; Profit Less Than Estimates". Bloomberg. Retrieved May 29, 2014. ^ "AKAMAI TECHNOLOGIES INC (AKAM) IPO". NASDAQ. Retrieved June 16, 2014. ^ "Akamai Technologies, Inc. Added to the Russell 3000 Index and Russell 2000 Index". July 17, 2001. Retrieved June 20, 2014. ^ Leopold, Todd (September 11, 2013). "The legacy of Danny Lewin, the first man to die on 9/11". CNN. Retrieved July 22, 2014. ^ "Akamai Technologies, Inc. (AKAM) Income Statement". Yahoo! Finance. Retrieved May 29, 2014. ^ Frier, Sarah; Mulier, Thomas (December 17, 2012). "Akamai Names Leighton CEO After Eight-Month Search". BloombergBusinessweek. Retrieved June 19, 2014. ^ Zakas, Nicholas C. (November 29, 2011). "How content delivery networks (CDNs) work". NCZOnline. ^ "Inside Akamai and the scary future of streaming video, GigaOm". August 19, 2011. Archived from the original on December 11, 2012. Retrieved March 12, 2012. ^ "Download Delivery". Akamai Technologies. January 26, 2018. Archived from the original on January 18, 2018. Retrieved January 26, 2018. ^ Ben Homer (January 26, 2010). "Akamai Using P2P for Enhanced Video Delivery". Online Video Watch. Archived from the original on May 15, 2013. Retrieved September 2, 2011. ^ "Akamai NetSession Interface – Design Principles". Akamai Technologies. Archived from the original on October 29, 2013. Retrieved September 2, 2011. ^ "Basic No-Frills 10 MB Test Download". Akamai Technologies. Archived from the original on October 29, 2013. Retrieved September 2, 2011. ^ Weiss, David (September 25, 2013). "Akamai Gets a New Network Operations Command Center". AV Network. Retrieved September 23, 2014. ^ "Akamai's NOCC To Monitor And Troubleshoot Client Servers". Silicon India News. November 25, 2013. Retrieved September 23, 2014. ^ "Akamai Releases First Quarter, 2014 'State of the Internet' Report". June 26, 2014. ^ "Akamai Introduces First-of-Its-Kind, Real-Time View into Health of the Internet". StreamingMedia.com. June 7, 2007. Retrieved September 23, 2014. ^ "Visualizing the internet with Akamai". DataVisualization.ch. March 23, 2009. Retrieved September 23, 2014. ^ Catone, Josh (June 7, 2007). "Akamai Releases Internet Traffic Visualizations". Readwrite.com. Retrieved September 23, 2014. ^ "Akamai Unveils Open Platform Initiative at Akamai Edge 2013 Customer Conference". Yahoo! Finance. October 9, 2013. Retrieved September 23, 2014. ^ Young, Jeff; Wolfe, Steven J. (October 18, 2000). "Akamai Unveils EdgeSuite, the Next Generation of Intelligent Content Services". Press release. Akamai Technologies. Archived from the original on January 22, 2014. Retrieved March 31, 2012. ^ "Overview of the Azure Content Delivery Network (CDN)". Microsoft Azure > Documentation. Retrieved March 7, 2017. ^ "Akamai ends Al Jazeera server support". news.cnet.com. Archived from the original on November 4, 2012. Retrieved April 2, 2009. ^ "Al Jazeera Denied Akamai Services". Tech.mit.edu. April 8, 2003. Archived from the original on November 7, 2013. Retrieved April 2, 2009. ^ "The NewsMarket partnered with Akamai to Accelerate Dynamic Content and Applications to Global Media Ahead of Beijing Olympics". Akamai Technologies. June 9, 2008. Archived from the original on February 19, 2014. ^ "Free Online Course Materials FAQ: Technology MIT OpenCourseWare:". Archived from the original on October 29, 2013. Retrieved June 14, 2010. ^ "Customer List". Akamai Technologies. Archived from the original on February 9, 2014. Retrieved October 22, 2014. ^ "Akamai Supports The Worldwide Simultaneous Release Of Nintendo's New Game Console And App". Akamai Technologies. August 28, 2017. Archived from the original on October 27, 2017. ^ "Akamai to Acquire Network24 Communications". StreamingMedia.com. January 18, 2000. Retrieved September 23, 2014. ^ a b c "Akamai Annual Report 2000" (PDF). Akamai Technologies, Inc.
^ Richtymyer, Richard (February 7, 2000). "Akamai buys InterVu". CNN Money. Retrieved September 23, 2014. ^ "Akamai Annual Report 2005" (PDF). Akamai Technologies, Inc.
^ Kawamoto, Dawn (November 20, 2006). "Akamai to buy Nine Systems". CNET News. Retrieved September 23, 2014. ^ "Akamai Annual Report 2006" (PDF). Akamai Technologies, Inc.
^ Gross, Grant (February 5, 2007). "Akamai to acquire Netli for about $170 million". NetworkWorld. Retrieved September 23, 2014. ^ Arrington, Michael (April 12, 2007). "Payday for Red Swoosh: $15 million from Akamai". Tech Crunch. Retrieved September 23, 2014. ^ a b "Akamai Annual Report 2009" (PDF). Akamai Technologies, Inc.
^ Kaplan, David (October 21, 2008). "Branching Out, Akamai Acquires Ad Targeter Acerno For $95 Million". Tech Crunch. Retrieved September 23, 2014. ^ "Akamai Annual Report 2010" (PDF). Akamai Technologies, Inc.
^ Boutin, Paul (June 10, 2010). "Akamai acquires mobile services company Velocitude". VentureBeat. Retrieved September 23, 2014. ^ a b c d "Akamai Annual Report 2012" (PDF). Akamai Technologies, Inc.
^ Huang, Gregory T. (February 8, 2012). "Akamai Buys Blaze as Web Optimization Heats Up in Boston". Xconomy. Retrieved September 23, 2014. ^ Wauters, Robin (December 22, 2011). "Done Deal – Akamai Buys Rival Cotendo For $268 Million". Tech Crunch. Retrieved September 23, 2014. ^ McCarthy, Maureen (September 14, 2012). "Akamai Technologies snaps up FastSoft". Boston Business Journal. Retrieved September 23, 2014. ^ Whittaker, Zack (November 13, 2012). "Akamai expands digital content delivery network, acquires Verivue". ZDNet. Retrieved September 23, 2014. ^ a b "Akamai Annual Report 2013" (PDF). Akamai Technologies, Inc.
^ Dignan, Larry (November 11, 2013). "Akamai buys Velocious Networks". ZDNet. Retrieved September 23, 2014. ^ Lunden, Ingrid (December 2, 2013). "Akamai Buys DDoS Prevention Specialist Prolexic For $370M To Ramp Up Security Offerings For Enterprises". TechCrunch. Retrieved September 23, 2014. ^ Castellanos, Sara (March 2, 2015). "Akamai Technologies acquires Colorado domain name system tech firm Xerocole". Retrieved September 20, 2015. ^ "Media Delivery Solutions for Streaming Video and Software Delivery - Akamai". www.akamai.com. ^ "Akamai Acquires Octoshape to Optimize Streaming Video - 040615 - Akamai". www.akamai.com. ^ "Bloxx - Real Time Web & Email Filtering". www.bloxx.com. ^ "Akamai Acquires Bloxx for Cloud Security - Akamai". www.akamai.com. ^ "Akamai Acquires Data Processing Provider Concord Systems - Akamai". www.akamai.com. ^ "Secure Application Access - Akamai". www.akamai.com. ^ "Akamai Acquires Soha Systems for Secure Remote Access to Enterprise Applications - Akamai". www.akamai.com. ^ "Bot Manager - Akamai". www.akamai.com. ^ "Akamai agrees to acquire SOASTA". Reuters. March 29, 2017. Retrieved October 11, 2017. ^ "Akamai agrees to acquire Nominum". Reuters. October 11, 2017. Retrieved October 11, 2017. ^ It is usually possible, however, to write such method patent claims in a way that all steps are performed by a single actor, for example, by replacing a step of sending a signal to the person performing the other steps with a step, instead, of receiving that signal. See, e.g., Michael Dzwonczyk Bulletproofing Method Claims for Post-Limelight Enforcement (Feb. 2014). Dzwonczyk asserts that the patent claim "could easily have been rewritten as a single-actor method claim that would not require the performance of any step by a second actor," and provides a rewritten version. See also Harold Wegner, Akamai II: Direct Infringement Déjà Vu (Aug. 2014) at 20-21, to similar effect. ^ Harrison Weber (May 15, 2014). "Facebook & Akamai respond to NSA slides alleging massive CDN vulnerability". VentureBeat. ^ Lisa Vaas (February 29, 2016). "Tor users being actively blocked on some websites". naked security. ^ "TorRules < Main < EmergingThreats". doc.emergingthreats.net.